8x10 gelatin silver print from 5x7 glass plate negative photographed by Morris Rosenfeld on July 17, 1920. Image of 110.33' Charles E. Nicholson designed, Camper & Nicholson built cutter SHAMROCK IV (built 1914 in Gosport, England) at second race of America's Cup off New York. 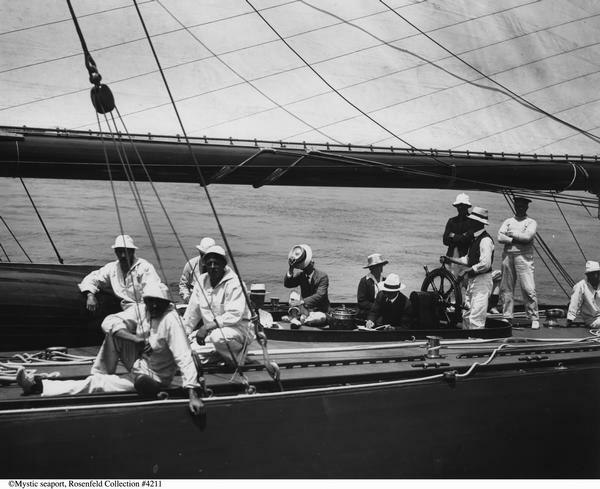 Visible in image: cropped aft deck port view of SHAMROCK IV with crew in whites sailor suits and white bucket hats, officers in straw hats, dark suit jackets and vests and white pants, a woman is seated in the cockpit, the main boom is visible overhead. Note on negative sleeve: "C. Nicholson (w/ hat); Mrs. Burton; Sherman Hoyt (writing); William P. Burton (at wheel); Capt. Turner (behind Burton to right)". CREDIT LINE: Mystic Seaport, Rosenfeld Collection, Charles Edwin Bolles photographer. For more information see: SLEEK, text by John Rousmaniere, p. 22-23 and 44. Stamped back in blue rectangular box: �MORRIS ROSENFELD & SONS / PHOTOGRAPHIC ILLUSTRATORS / 163 WEST 23rd ST., N.Y. 10011 / Phone: 989-2404�.